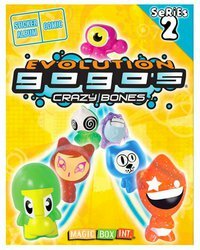 Have you heard of Gogo’s Crazy Bones? To be totally honest, I have never heard of them and had no idea what they even were until about two months ago! I was given a free package at Walgreens and a few days later I was offered to host a Gogo’s Crazy Bones Bonanza Party. It seems that these cute little guys are the latest and greatest craze that kids go crazy for! Since school is out, parents are on the watch for the hottest summer toys and gadgets to keep their kids entertained and Gogo’s Crazy Bones are the must-have toy of the season with new and exciting characters available to collect and trade! The first thing my 7 year old daughter said when she opened a package of Gogo's Crazy Bones was... "COOL! Thanks Mom, I love these!" She fell in love instantly and played with them for over an hour. When it was time for her to get ready for bed, she was heartbroken. Making her feel better was easy because she took her Gogo's to bed with her for a sleepover! She lined them up beside her and drifted off to dream in Gogo land. When she woke up in the morning she picked them all up and took them to the table with her for breakfast. My 10 year old son enjoys playing with them too. It's one of those rare oddidites of items that they both enjoy playing with and can actually play together and have lots of fun together without arguments. There are 80 bold, colorful and adorable characters in Gogo’s Crazy Bones Series One and another 80 vibrant, radiant and unique characters in Series Two. Each one has a personality all its own with its own unique name and special power. Some of the facial expressions are simply priceless and put a smile on my face. They are fun and unique which is sure to please children as well as parents. Gogo's Crazy Bones provide hours of laughs, fun and entertainment. In addition, they also spark the imagination in every child who touches them. As a parent, I love any toy or game that can do that. My only complaint is that these little guys hurt like crazy when you step on them with bare feet, especially in the middle of the night! Collect them, trade them, play with them! They are perfect for rewards, party favors, goody bags and stocking stuffers! Be sure to join the official Gogo's Crazy Bones Fan page and have lots of chances to win cool Gogo's Crazy Bones prizes! Gogo's are the hottest mini game toy--small colorful characters that come in hundreds of colors and designs, each one with a unique name, design, personality and special ability. Today’s Gogo’s are reminiscent of old school favorites such as marbles and jacks, with a modern twist! Each Gogo has a unique number for collecting and is designed so you can hold and throw them with one finger. Kids have a blast collecting, trading and playing with Gogo's Crazy Bones. Note: Gogo’s Crazy Bones contain small parts and are not suitable for children under 4. Tell me WHY you would like to win this prize pack. A special thanks to NKPR for this great review and giveaway opportunity! I would love to win this prize pack because my 9 yr old & 4 yr old both LOVE these! In fact, these little guys are the only toys they can spend hours playing with while almost always getting along! My middle son turns 10 in a few days & my youngest turns 5 in a month so of course these would be so cool to give to them both for their birthdays. If this can entertain my 8 y.o. for an hour then I NEED it! i would like to win these for my 7 yr old we just moved and he doesnt have that many toys anymore. I would love to win this for my nephew. I think he would really like it. Like Gogo's Crazy Bones on FB. it looks like fun. i think my daughter would like it! I don't know much about these little guys, but when I mentioned them to my oldest son, he went nuts. "Oh, PLEASE, MOM! Try to win them!!!" LOL I think that's reason enough to want to win! I have 4 children who would love these so much! subscribed to being frugal and making it work emails!! It's something all my kids would enjoy. I would like to win this prize pack because it looks very nice! I follow Gogo's Crazy Bones on Facebook under the username likwan. I follow Gogo on Twitter under the username likwan. I tweeted this about giveaway on Twitter at http://twitter.com/likwan/status/91008882964570112.